Baltimore, MD -- Natasha Wainwright is a Baltimore-based entrepreneur who previously founded and ran an eco-friendly daycare, Progress Place Learning Center (PPLC). Natasha's Just Brittle was conceived in summer 2009 as part of a business fundamentals learning project for the children at her daycare. PPLC Sweet Treats, the daycare's made-to-order sweet shop, sold over $500 in confections that summer. The brittle was the most popular item and was in high demand from the community long after, sparking the creation of Natasha's Just Brittle and an opportunity to present and sell-out on QVC. 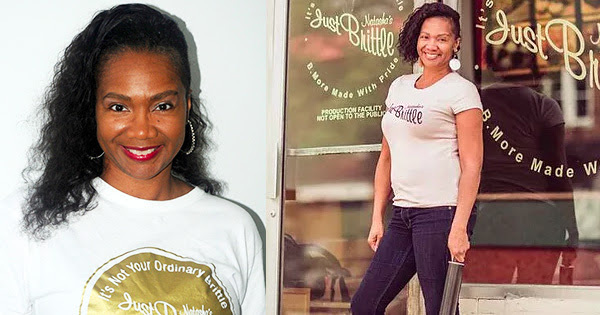 "Although we sold-out of brittle on QVC, I did not have space or staff to manufacture the volume of handcrafted brittles and that is why I opened B'More Made with Pride Commercial Kitchen to support myself and fellow culinary artisans," says Natasha. "This is a game changer for small businesses, however, I cannot keep the doors open without the support of the people." Recently, Natasha's Just Brittle was added to the 2019 Visit Baltimore campaign. Natasha's Just Brittle is not your ordinary brittle. Handcrafted and hand cut in small batches using an all-natural base of a mixture of brown and white sugar, butter, sea salt, and agave, the brittle comes in over 37 flavors and counting. "Everything I am is because of Baltimore, the support of the city, community, parents, and family. I went from being bullied, contemplated suicide as a teen, to becoming a change agent as a daycare owner, to now entrepreneur." Natasha's Just Brittle has been profiled in Baltimore Style Magazine. In 2018, Natasha won the $10,000 "Pitch Room" grant hosted by Samuel Adams Brewery and $20,000 winner of the "New Voice Fund." She was also chosen to audition on Shark Tank. Also, Wainwright appeared as one of 18 finalists, selected from hundreds of contestants, on BET's Queen Boss, a television series competition that featured fast-rising female entrepreneurs pitching their products and company to celebrity judges. Natasha's Just Brittle is available at Whole Foods in select stores from Riverdale, Mount Washington, and Annapolis and Gourmet Shops throughout Maryland. "Today, I am at a critical point to keep the doors open due to the economy and rising costs of rent. My company, B'More Made with Pride Commercial Kitchen is a place where food producers can prepare, process, cook and store perishables. It is a fully licensed, equipped facility for catering, food preparation, and specialty food production," says Natasha. Natasha's Just Brittle also offers tasty sweet treats, and, great activities for adults and families. From brittle bark classes paired with wine tasting to children's cooking classes and nutritional healthy meals. "This is where I'm from. And I just want to be known for being a Baltimore business, which is why we call the second part of our business B'More Made with Pride. I want our community to love and appreciate what we do right at home. Everything begins with a dream and support," cries Wainwright. To learn more about Natasha's Just Brittle and Natasha Wainwright, visit her website at www.justbrittlez.com. To schedule an interview and save Natasha's Just Brittle, contact her via email at natashasjustbrittle@gmail.com or visit her crowdfunding page at https://ifundwomen.com/projects/bmore-made-pride-commercial-kitchen.